Though during the composition of the content on the website of Van Rijn-De Bruyn the greatest possible care is exercised, it is possible that some information may be incomplete, out of date or no longer correct. Van Rijn-De Bruyn shall not be liable for the consequences of activities undertaken on the basis of this site, and apart from that the site shall not create any rights at all. Van Rijn-de Bruyn will not accept any liability for damage caused by incorrect and/or outdated information. This site enjoys copyright protection. This site is intended for personal or internal use of our customers, by which it is not allowed to reproduce the site otherwise than by downloading and viewing on a single computer, and/or the printing of a single "hard copy". Without written prior consent of Van Rijn-De Bruyn it is not allowed to reproduce this site or otherwise, to transmit or make this site available on a network. This site is intended for the provision of information to our customers. We have composed the contents of this site with the greatest possible care, but cannot give assurances with regard to the nature or the content of the information on this site. We will not be liable for the content of this information or for the consequences of their use. It is not allowed to frame this site. We believe we are not responsible or liable for the access to or information on any site that is linked from or linked to this site. All brand names and ideographs on this site are the property of van Rijn-de Bruyn, or of the relating owners of the varieties. Without written consent of van Rijn-de Bruyn, or of the relating owners of the varieties it is not allowed to make use of these trade marks. 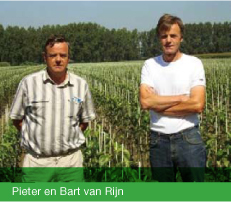 If you want more information, you can send an email to info@vanrijn-debruyn.com.